Americans for Legal Immigration PAC (ALIPAC) is taking steps today to alert anti-illegal immigration activists across America to an important ballot measure in Oregon called Measure 105 which would end Oregon's sanctuary state policies that prevent local police from working with federal immigration authorities to deport illegal immigrants. Local activists in Oregon, working with groups like Oregonians for Immigration Reform (OFIR), gathered enough signatures on Initiative Petition 22 (IP 22) to get Ballot Measure 105 on the ballot for the midterm elections of 2018. In 2018, voters of Oregon have a chance to vote "Yes on 105" to end Oregon's sanctuary state laws for illegal aliens which currently allow illegals to commit crime and go in and out of Oregon's local jails without deportation which increases the number of Americans robbed, raped, injured, and killed by illegals. Oregon is considered a solid blue Democrat Party stronghold state; yet in 2014 voters from all races, parties, and walks of life passed Measure 88 with 66% of the vote and 35 of Oregon's 36 counties voting to deny licenses to illegals. Measure 88 was a public vote and a reaction to a law passed by the Oregon Legislature in 2013 and signed by then Gov. John Kitzhaber, a Democrat, that would have given "driver's cards" to those who cannot prove they are in the U.S. legally. Measure 88 to deny licenses won big despite being outspent 10-to-one, and now Proposition 105 may do the same. ALIPAC opposes licenses, in-state tuition breaks, and sanctuary state and city policies on the local level, and has worked to help defeat such measures in more than 30 states over the years. 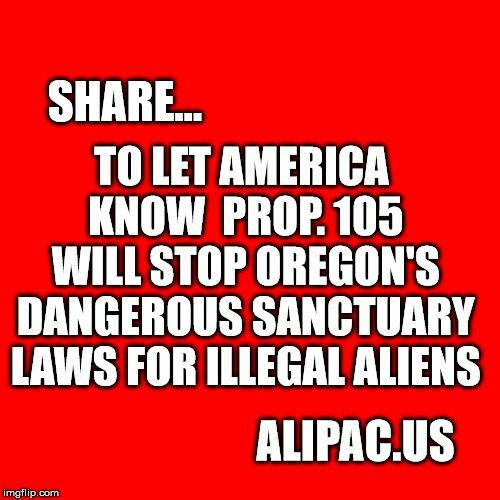 "All of America should keep an eye on Measure 105 in Oregon because that state has proven the fake polls wrong and reinforces our poll collection which shows Americans of all races, parties, and walks of life overwhelmingly oppose illegal immigration and benefits for illegal aliens," said William Gheen, President of ALIPAC. "A win against sanctuary state laws in Oregon this year could give our movement the momentum needed to help stop sanctuary policies in California, Colorado, Illinois, Massachusetts, New Mexico, and even Vermont!" The Center for Immigration Studies currently lists 7 American states as sanctuary states (View). In the states of Oregon, California, Colorado, Illinois, Massachusetts, New Mexico, and Vermont, legal immigrants and US citizens are more likely to be harmed or killed by illegal aliens who have enjoyed political and legal protection from Soros backed groups, leftist media, and Democrat controlled state legislatures. Oregon became America's first sanctuary state for illegals in 1987 without input from the citizenry. Last edited by ALIPAC; 10-25-2018 at 01:43 PM. Beezer and Captainron like this.